The easiest way to wreck a family enterprise is to raise the next generation with a sense of entitlement. Entitlement starts at an early age when parents provide their kids with not only all their “needs” but with all their “wants” as well. So what are the kids to expect? This continues into adolescence and adulthood, when parents provide them with all their tech desires and, of course, a shiny new car once they get their licenses. Many parents want to give their kids that which they never had, but without some “skin in the game,” without a financial or work commitment on their part, the next gen can carry these expectations into adulthood. Outside experience also gives the younger generation an opportunity to learn different skills, see how other companies operate and even to make some mistakes outside of the family’s enterprise. Most important, this outside experience gives the next generation members confidence that they can make it on their own. When they enter, they’ll have greater respect from the non-family employees and other stakeholders. Caution – go easy on the perks. A new BMW and high salary will not be received positively by others. Clarity of role and responsibility are essential. 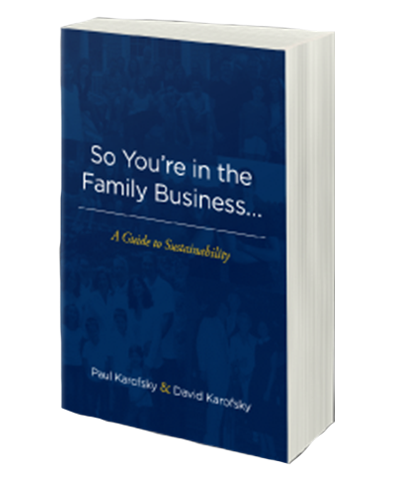 While we understand that in a family enterprise we all do whatever might be necessary at the time, family members need to have clarity on the role and responsibility that is theirs. It’s tough to know if expectations are being met or to measure performance without it. Is the new entrant to start at the bottom or at the top or somewhere in between? Are there specific criteria that must be met for each position, including education, skill sets and past experience? Will family members be expected to have the same competencies as non-family members? To whom will they report (hopefully not to Mom or Dad)? A clearly defined role and job description will be well received by not only the newly hired family member, but by the rest of the organization as well. Why is it that non-family members typically go through formal evaluations, but all too often family members do not? Is there concern we might hurt someone’s feelings? Performance assessment isn’t about scolding or punishing or even criticizing. It’s about heightening self-awareness (which research shows is the most vital attribute of leadership) and presenting opportunities for growth and improvement. On that basis, wouldn’t we think that performance reviews for family members are more vital than for anyone else? We tend to like the 360 degree process. It gives family members an opportunity to assess their own competencies and compare them with the perspective of others – those to whom they report, those on their peer level and those who report to them. We suggest that the 360 be administered by an objective 3rd party and shared only with the family members being assessed. We further suggest that the administrator work with family members to design an appropriate protocol and a list of suggested respondents. Open ended and quantitative data are collected anonymously to afford confidentiality so neither the administrator nor the family member knows who said what. The process is a gift to family members who can show their appreciation by grasping the feedback and modifying behavior when appropriate. The result? A stronger, more aware and competent family member and, hence, a stronger more competent family enterprise. Some families learn about unconditional love, acceptance and forgiveness and oftentimes don’t perceive the need to talk about “problems.” They let things go. In other families, there is a culture of battle –arguing out disagreements until they’re resolved. In the context of family enterprise, we urge open and candid and prompt discussion of differences and conflicts. Lots has been written about how to have difficult conversations and not be difficult. Keeping issues unresolved only builds resentment that can erupt into an even larger conflict or, in some instances, total withdrawal. We’ve seen too many instances of family members getting “fed up” and exiting the enterprise emotionally and sometimes physically. We encourage a defined process for communicating. For some it’s a Tuesday morning breakfast with family stakeholders, for others it’s a facilitated monthly family meeting. Routine, structured discussion is critical to success. It can assure family members they are in synch with one another, share goals and priorities and promptly address differences. Formal boards of directors and the less formal, boards of advisors can help enterprising families stay on track. We recommend several non-family member professionals with competencies that match the critical success factors of the enterprise. They can provide much need external perspective to guide, coach and support all toward their desired goals. Typical resistance to boards includes a reluctance to share financial information and the warts and moles that lie within the family and the enterprise. The underlying issue is trust. To what degree are you willing to trust others? Professionals treat these matters with the utmost confidentiality and most typically already have a sense of what’s going on inside the board room. Other resistance includes the family members not wanting to do the hard work that outside board members expect. This includes preparing financial reports, an analytical review of where the business has been and where it’s going to guide strategic planning, SWOT and competitive analyses and more. We find that families that are willing to prepare find that experience in itself of enormous value. Perhaps the most compelling reason for to have a “board,” is to help with process of transition. Board seats ought not be for life. We encourage rolling terms – some members for two years, others for three, to ensure that there is not a total turnover. And while you may wish to include your accountant and/or attorney, we suggest that they be invited when appropriate as guests and not as formal board members. Avoid asking friends to serve; they won’t be neutrals and you’ve already heard their opinions. The same applies to retired employees and bankers. Change is never easy but neither is running a family enterprise. As you plan for the entrance of the next generation, it may be time to consider doing things differently than in the past. Being a sustainable enterprise is indeed a challenge and the odds in fact are against it. Classic research shows the top causes of failed succession to be 1) unresolved conflict, 2) failed leadership, and 3) lack of shared goals on a personal, family and business level. Our anecdotal evidence is akin to the above.